Gas and oil are pivotal to the functioning of modern societies, yet the ownership, control, production and consumption of hydrocarbons often provokes intense disputes with serious ramifications. In Gas, oil and the Irish state Dr Amanda Slevin examines the dynamics and conflicts of state hydrocarbon management and provides the first comprehensive study of the Irish model. Interpreting the Corrib gas conflict as a microcosm of the Irish state's approach to hydrocarbon management, Slevin articulates environmental, health and safety concerns underpinning community resistance to the project. She emphasises how the dispute exposed broader issues, such as the privatisation of Irish hydrocarbons in exchange for one of the lowest rates of government take in the world, and served to problematise how the state functions, its close relationship with capital and its deployment of coercive force to repress dissent. Analysis of these issues occurs within an original account of decision-making and policy formation around Irish hydrocarbons from 1957 to 2014. 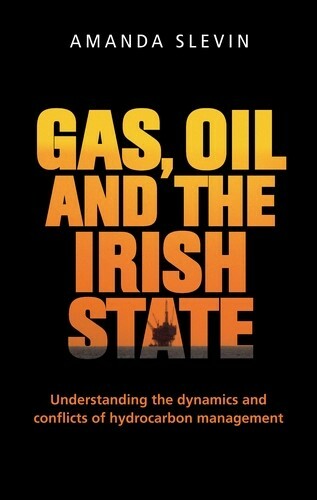 Gas, oil and the Irish state traces the development of the state's approach in tandem with occurrences in Irish political economy and examines the impact of global trends on different approaches to hydrocarbon management. A comparative case study of Norway reveals ideological, political, social and economic forces which influence how states manage their hydrocarbons - factors which the author uses as the basis for a rigorous critique of the Irish model. Gas, oil and the Irish state: Understanding the dynamics and conflicts of hydrocarbon management can be purchased from Manchester University Press.